Few days back we hosed you how to unlock bootloader and install recovery on YU Yureka, and how to get the root access on the Micromax YU Yureka. If you already followed these method and enjoying your phone with some mods and other tweaks or enjoying some other Custom ROM on your device, and want to go back to the stock firmware. 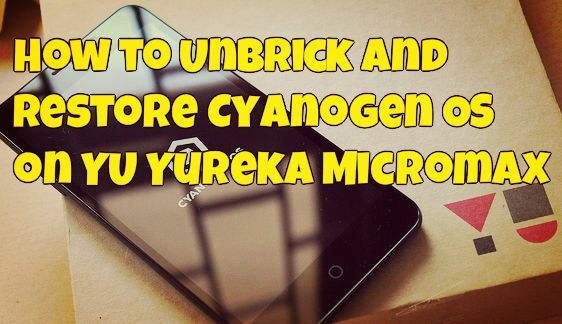 Today in this guide we;ll show you a simple and easiest method to restore the Cyanogen OS on YU Yureka Micromax. The guide is very easy and doesn’t requires using any commands or a toolkit. A simple script will let you automatically flash the stock firmware on Yureka in less than 2 minutes. You can use the same guide on your Bricked devcie and install the official stock firmware in a few minutes. Note: This guide will WIPE entire data on your phone, except any data stored on the external microSD card. Before proceeding, make sure your phone is charged and you’ve taken a backup of your important data. Read all the instruction very carefully and follow all the steps one by one on your phone. Step 1. Download Yureka factory image here and extract the folder on your desktop. Step 2. Now download the ADB and Fastboot file on your desktop and extract the folder. Step 5. Once your phone in fastboot mode, Run flash-all.bat by double clicking on it. Step 6. Now a command windows will open on your screen, and flashing process will start. DO NOT disconnect the device during flashing procedure. The command window will close after the flashing process is over. Step 7. Disconnect the USB cable, and boot the phone normally by long pressing the Power button. Enjoy! Now your phone is running on the Stock Cyanogen OS Firmware.